Essential reading for all consumers this past December in the pages of The New Republic to be found in Alex Shepard's "Amazon Dominated Nearly Everything This Year". Particularly notable when one considers the contributing effect this will have on the cultural character, retail landscape, competitive housing environment, and wealth stratification in their host city, when Amazon chooses it's second corporate headquarters. Not to mention the conditions of the workplace environment and it's corporate ethos, as detailed in the New York Times extensive expose of last year, "Inside Amazon: Wrestling Big Ideas in a Bruising Workplace". Further plans to expand into physical retail were also revealed in recent months, "Why Amazon Just Opened a Physical Bookstore", with upwards of 300 of their bookstores speculated to open nationwide. Or, as Gizmodo puts it, "Amazon Will Open Physical Bookstores Because Life is a Practical Joke Played on Us All". Of less levity, the documentation of the "Amazon Effect" continues on NPR this morning in their feature "Big Behemoth? 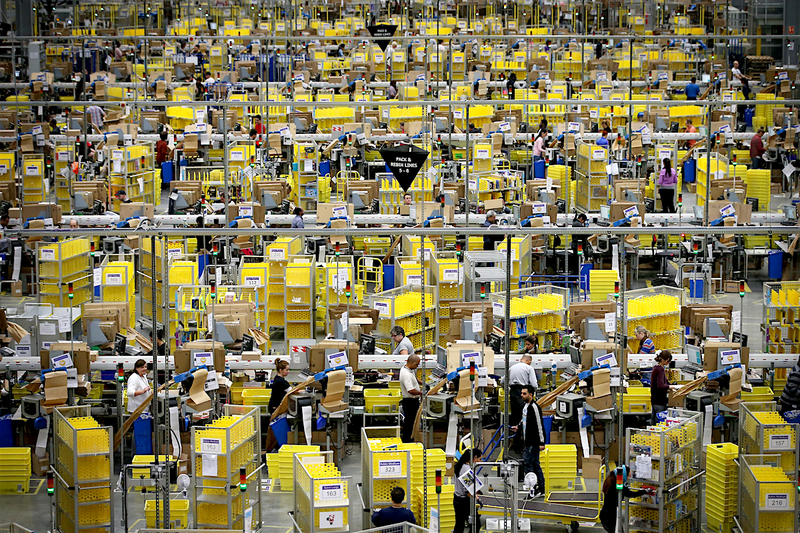 : How Amazon Could Upend the U.S. Economy", with Stacy Mitchell co-director of the Institute for Self-Reliance, and author of "Amazon’s Stranglehold: How the Company’s Tightening Grip Is Stifling Competition, Eroding Jobs, and Threatening Communities". She is joined by James Marcus, editor at Harper's Magazine, and author of "Amazonia: Five Years at the Epicenter of the Dot-Com Juggernaut". As they discuss the nature of the Amazon's grip on the economy, as well as the question whether with the company's latest series of acquisitions, it has opened itself up to the grounds of an extensive anti-trust suit. Concurrently, a limited but informed subset of book consumers are beginning to question their default to Amazon as the go-to for all things print and beyond. This was brought on by 2015's flexing of power in the publishing and distribution world, when Amazon delayed deliveries and prevented pre-orders on titles in relation against the publishers Hatchette Book Group and Bonnier. This heightened awareness would only have caused minor ripples (at best) in consumer response and awareness, if it wasn't for Hachette having an ally in Stephen Colbert and his campaign, "I Didn't Buy It On Amazon". See his dialog on the subject with social activist and writer, Sherman Alexie, for reference. Rallying awareness and solidarity among book retailers, Colbert paired with one of the nation's largest independents, Portland's Powell's Books to drive pre-orders on many titles, as "Indie Booksellers Join Hachette's Battle with Amazon". A few higher profile news and entertainment vehicles have been getting in on the game, positing that in the midst of this all, we take advantage of the existing book retail options we have in our urban centers. Editorial pieces like Stephen Marche's "How to Quit Amazon and Shop in an Actual Bookstore (and Why You Damn Well Should)" giving renewed relevance to Steve Wasserman's essential reading in the pages of The Nation, "The Amazon Effect". Among other consequences of Amazon's dominance, Wasserman discusses what many unwitting consumers are relinquishing, and may not be able to replace, in making the shift to online buying from a single marketplace holding a dominating percentage of the field. All the while many of us live in cities where the (few remaining) independent retail choices still exist. These both read as excellent companion pieces to Tony Sanfilippo on the future of place and community-oriented books retail, "Book Places in the Digital Age".